The Newport Chamber Music Festival packs a lot of programming into its 2½ weeks, and so one often finds interesting concerts at, shall we say, awkward times of day. Undaunted, we forwent divine offices and careered down Route 24 for an 11 am Sunday entry at Ochre Court of mostly strings, capped by a delightful rarity. One should first pause to acknowledge the splendor of the surroundings, not only Newport’s natural(ish) seaside splendor, but of the built environment that houses the festival. Several of the venues, most of which are Gilded Age “cottages,” are under the control of Salve Regina University. 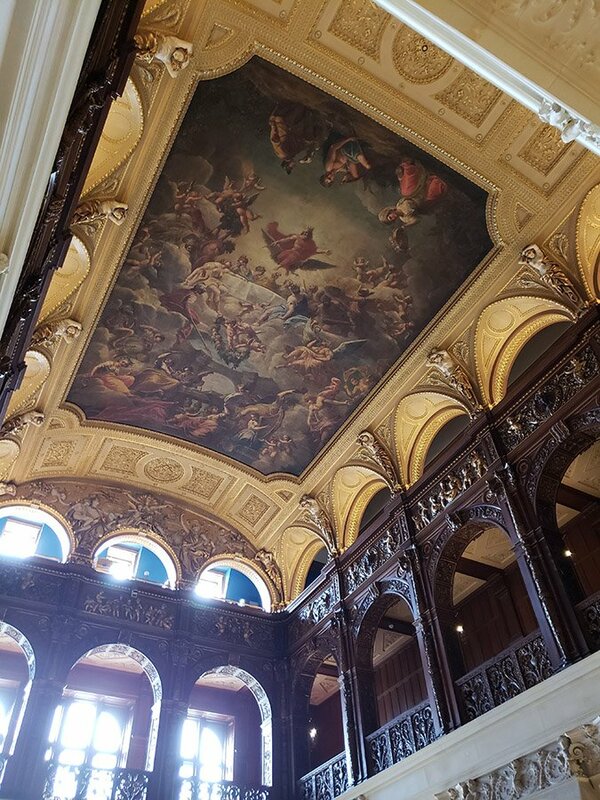 Ochre Court, which has not featured at the festival for several years, is now SRU’s admissions and administration building, and it’s a Richard Morris Hunt Barocuckoo gem. The central ballroom in which the concerts occur backs out onto the lawns and ocean, and brilliant sky, somewhat like the Shalin Liu in Rockport; and this fact points also to its slight drawback: backlighting (a bank of stage lights was called into service up on the balconies, so you could see more of the performers than just their silhouettes). There also was some issue over air conditioning: heat and humidity did not oppress the audience, but some of the players stoutly averred that there was, unlike in other NMF venues, no a/c that they could detect. On a very sticky day, this mattered. The ad hoc string quartet comprising violinists Sirena Huang and Irina Muresanu, violist Luke Fleming, and cellist Jacqueline Choi opened with Smetana’s String Quartet No. 1 in E Minor (1876), subtitled From My Life. The autobiographical program of the piece is not necessary for its appreciation until the finale, but the four movements are meant to evoke ardent Romantic passions, carefree youth, romantic love, and, finally, the joy of life, dashed by the deafness that descended on him beginning two years before the quartet’s composition. The opening movement features a motto motif stressing a descending fifth, begun in the viola, and Fleming’s stabbing and anguished reading set the admirable tone for the ensemble. Despite Smetana’s protestations that he let the content dictate the form, this one is in perfectly up-and-down sonata form, with a throbbing second subject. The players were intense and mercurial, not always totally refined in phrasing, and ended with a perfect fade. The second movement is the scherzo, in this case “à la Polka” and thus in duple meter (if you know this already, you may skip forward, but the Polka is not Polish, it’s a Czech dance whose name is thought to derive from the Czech word for “half,” as in the cut or 2/4 time signature). It’s a wonderful movement, full of bounce and vitality, though the room acoustic made hearing the detailed articulation in the outer sections problematic. The trio has a wonderful “drag” or hesitation rhythm, which came across with much pep. After the tender, heartfelt slow movement, the finale began in a jolly and bouncing E major mood, until cut short by a searing (almost) high E in the violin that signified the tinnitus that announced the onset of Smetana’s deafness. There followed much soberness, in the return of the mournful motto. With a gentle air of resignation leavened by a touch of hope, the quartet faded away as in its first movement. We would be derelict in our journalistic duty if we were not to mention the one problem that infected this otherwise delightful reading. After the first movement, intonation began to wander—we rack it up to seaside summertime humidity. It got progressively worse through the third movement, resulting in some painfully creative pitches and intervals. And though the players recovered somewhat in the finale, that high E came in at a few cents shy. That’s summer music for you. The first half closed with the slow movement from Barber’s String Quartet in B Minor, op. 11. The (now free) handout and Flemings stage talk referred to it as the Adagio for Strings, but technically that only applies to Barber’s and other people’s subsequent arrangements, chiefly Barber’s for string orchestra. Voted “the saddest piece of classical music ever” by BBC Today audiences, it achieved a new lease on life, as it were, as a funeral or memorial piece, a fate it shares with the “Nimrod” variation from Elgar’s Enigma Variations. We’ve always found it more serene and stately, like a sarabande. Curiously, its structure and affect is remarkably similar to the slow movement of the avant-gardist Ruth Crawford Seeger’s string quartet, except that after the big tightly harmonized climax Barber allows the listener a cathartic release. The performance kept the lines flowing through the complex meter changes, showed fine dynamic control into the climax, and proved sublime in its release and unsettling dominant-chord ending. Intonational issues were minimal. The Vaughan Williams Piano Quintet in C Minor (1903) provided the big finish. After its 1905 premiere both the composer and later his widow suppressed its performance, until it was finally allowed out of its dungeon in 1999. It was the last-composed of several early RVW works (the designation “early” is misleading, in that it’s not at all juvenilia) he chose not to publish or circulate after he settled on his mature style. In that respect it occupies a position rather like the wonderful piano quintet of Bartók and the early chamber music of Richard Strauss—perfectly worthy, all. The RVW quintet is unusual in several ways: first, it’s a reversion to the Schubert Trout Quintet scoring of piano, string trio and contrabass—which was pretty much how all piano quintets were done before Schumann—and second, it’s a transitional work that shows strong indications of the direction in which RVW’s music was heading, unlike the much more Brahmsian 1898 quintet for clarinet, horn and piano trio. For RVW, however, the piece seems quite usual. it’s a lovely work, with strongly modal melody and, notably, an approach to scoring the bass that, unlike pre-Schumann quintets with bass, doesn’t just double the cello but creates a fully independent part. It’s been recorded both live and on CD, and you can hear it on the usual streaming sources. In his onstage introduction, Fleming flatly declared that there were hymn tunes used in this piece, though nothing else we’ve read about it says so. We’ll take his word for it—the theme of the finale at least is seemingly folk or hymn inspired, if not an actual quote.